Border Beauty offers a wide range of beauty treatments using the Environ® and Mavala® product ranges. 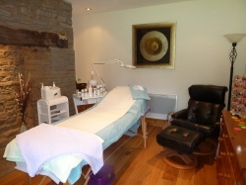 The salon is in rural Herefordshire 5 miles from the towns of Kington and Hay-on-wye. Pamper Parties also available. Great for Hen Parties, Birthdays and Celebrations. Beauty Treatments using the Environ® skincare product. A beautiful skin is a healthy skin. Regular facials combined with a good home care routine will ensure your skin is balanced and healthy. Environ® products contain highly active ingredients to protect the skin from environmental aggressors and combat the visible signs of ageing. Well defined eyebrows and eyelashes emphasize the eyes and define their shape. This helps to balance the facial features. Improve the appearance and condition of your hands with a regular manicure. The Mavala range includes a variety of nail and hand treatment products along with a wide range of beautiful polishes. Feet do not generally get the attention they deserve - they work hard for us. A regular pedicure will help improve the appearance, condition and comfort of the feet. The Mavala range includes a variety of nail and foot treatment products along with a wide range of beautiful polishes. Waxing to remove unwanted hair gives super smooth results that last for 4-6 weeks. Using the PhD waxing system provides a safe and hygienic waxing procedure. jane iredale® mineral cosmetics provide flawless coverage while caring for skin. © My Website. All rights reserved. Design by Border Beauty.